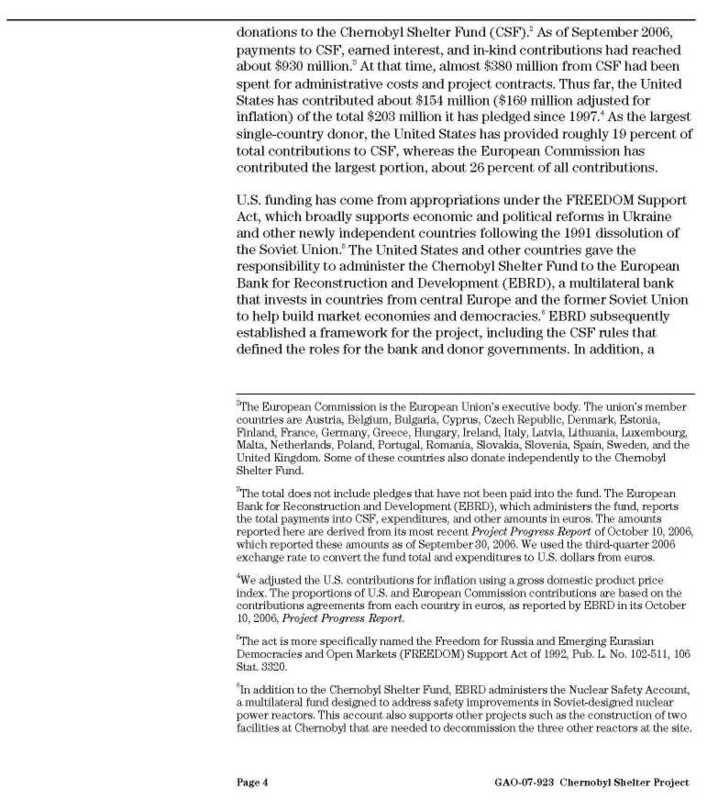 4,010 pages of CIA, Department of Defense, Department of Energy, Congressional, GAO, and foreign press monitoring files related to the Chernobyl Nuclear Accident. On Sunday April 26, 1986, at the Chernobyl Nuclear Power Plant near Pripyat, Ukraine, reactor #4 exploded. This incident has been referred to as the world's worst nuclear power plant accident. According to reports filed with International Atomic Energy Agency (IAEA) on April 25, 1986, technicians at the Chernobyl plant launched a poorly executed experiment to test the emergency electricity supply to one of its Soviet RBMK type design reactors. The test was meant to measure a turbogenerator's ability to provide in-house emergency power after shutting off its steam supply. During the experiment the technicians violated several rules in place for operating the reactor. During the experiment, the emergency shutdown system was turned off. The reactor was being operated with too many control rods withdrawn. These human errors, coupled with a design flaw that allowed reactor power to surge when uncontrolled steam generation began in the core, set up the conditions for the accident. A chain of events lasting 40 seconds occurred at 1:23 AM on April 26. The technicians operating the reactor put the reactor in an unstable condition, so reactor power increased rapidly when the experiment began. 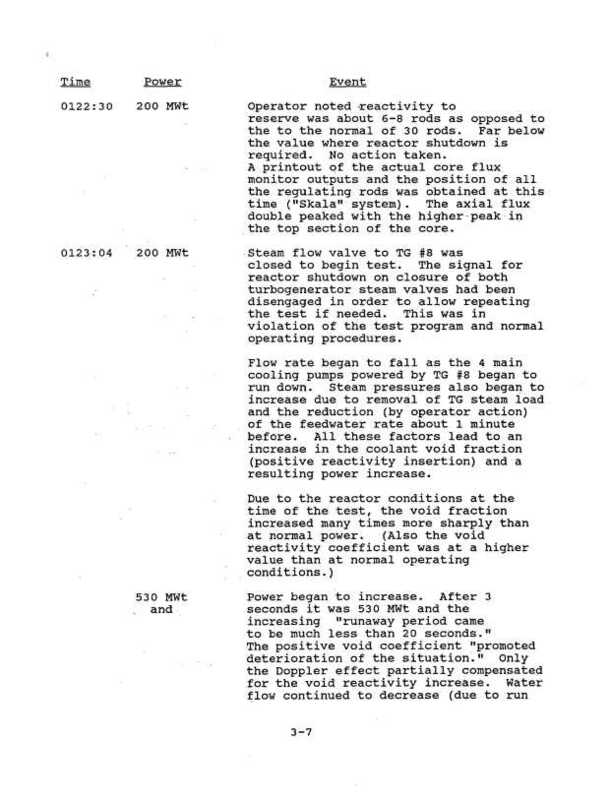 Subsequent analysis of the Soviet data by U.S. experts at the Department of Energy, suggests the power surge may have accelerated when the operators tried an emergency shutdown of the reactor. According to Soviet data, the energy released was, for a fraction of a second, 350 times the rated capacity of the reactor. This burst of energy resulted in an instantaneous and violent surge of heat and pressure, rupturing fuel channels and releasing steam that disrupted large portions of the core. The surge destroyed the core of reactor unit four, containing approximately 200 tons of nuclear fuel. Some of the shattered core material was propelled through the roof of the reactor building. The hot core material of reactor 4 started about 30 separate fires in the unit 4 reactor hall and turbine building, as well as on the roof of the adjoining unit 3. All but the main fire in the graphite moderator material still inside unit 4 were extinguished in a few hours. It was a day and a half before the people living in Pripyat were ordered to evacuate. The residents were told they would only be gone for several days, so they left nearly everything behind. They never returned. Soviet authorities made the decision not to cancel May 1, May Day, outdoor parades in the region four days later. The graphite fire continued to burn for nearly two weeks carrying radioactivity high into the atmosphere, until it was smothered by sand, lead, dolomite, and boron dropped from helicopters. Despite the wide spread of radiation, Soviet officials at first said very little publicly about what happened at Chernobyl. It was not until alarms from radiation detectors in other countries, many hundreds of miles away, forced the Soviets to admit to the Chernobyl accident. Radioactive material was dispersed over 60,000 square miles of Ukraine, Belarus, and Russia. Smaller amounts of radioactive material were detected over Eastern and Western Europe, Scandinavia and even the United States. The accident has left some nearby towns uninhabitable to this day. Radioactivity forced Soviet officials to create a 30-kilometer-wide no-habitation zone around Chernobyl, sealing off Pripyat. Still, the power plant continued to generate electricity until it was finally shut down in December, 2000. During the first year after the accident, about 25,000 people, mainly Soviet Army troops, were dispatched to the site to clean up the accident. Thousands of workers, called liquidators, were employed during the following years of the cleanup. Around October, 1986 the construction of a 21 story high metal and concrete shelter was completed, enclosing the reactor and the radioactive material that remained. Almost 200 tonnes of melted nuclear fuel rods remain within the damaged reactor. This containment shelter was not intended to be a permanent solution for containing the radioactive material. Over time, the shelter has weakened; rain entering through holes and cracks has caused corroding. By 2006 the plans for a new shelter was about 7 years behind schedule, with a completion target date of no sooner than 2012. 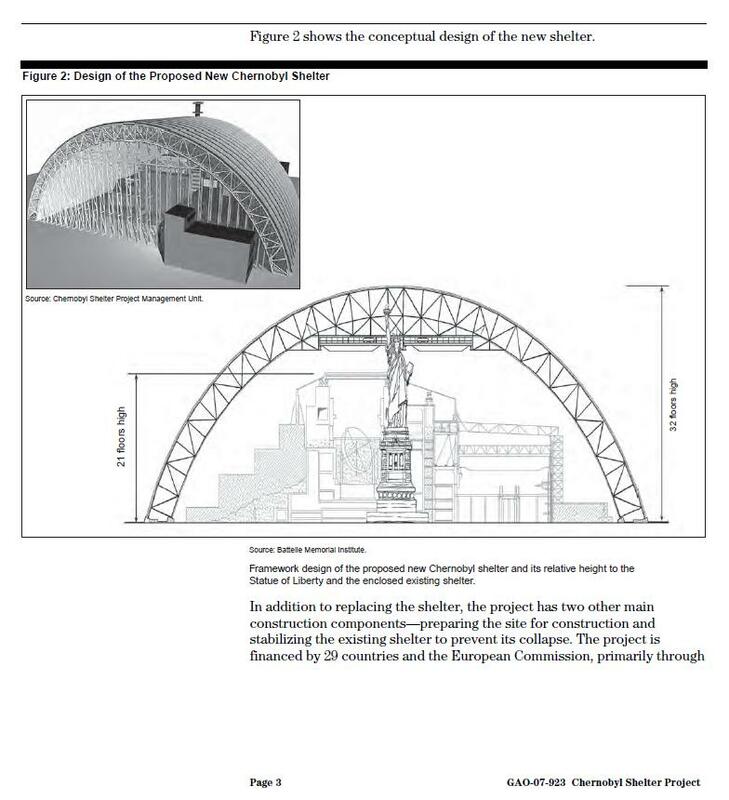 In February of 2011 it was reported that construction of the shelter may have to be halted, due to a $1 billion dollar short fall in the funds needed to complete the structure. A United Nations report released in February 2011 estimates the Chernobyl disaster caused thyroid cancer in 7,000 children in the affected area. The report said despite the high rate of cancer, only 15 fatalities in these 7,000 cases have occurred. 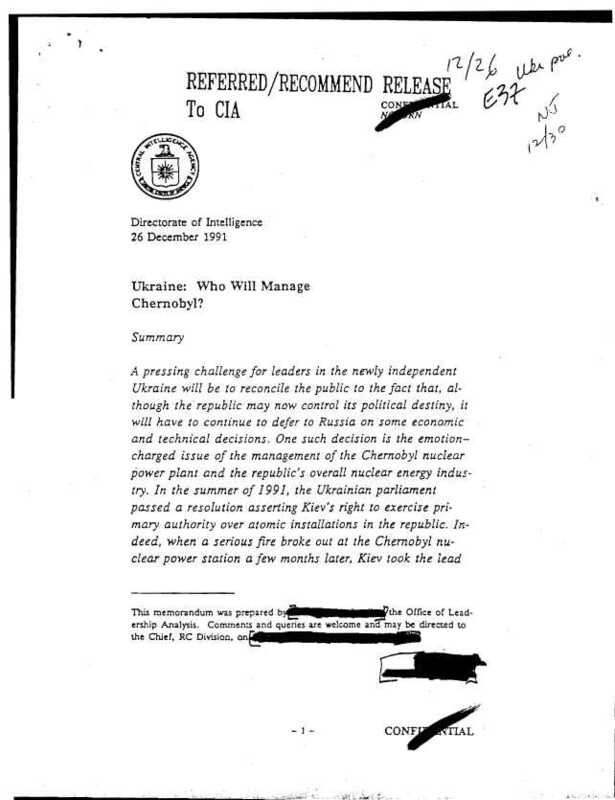 215 pages of CIA files dating from 1971 to 1991.The files cover the Soviet Union's atomic energy program; The effect of the Chernobyl accident on the Soviet nuclear power program; and the social and political ramifications of the accident in the Soviet Union. 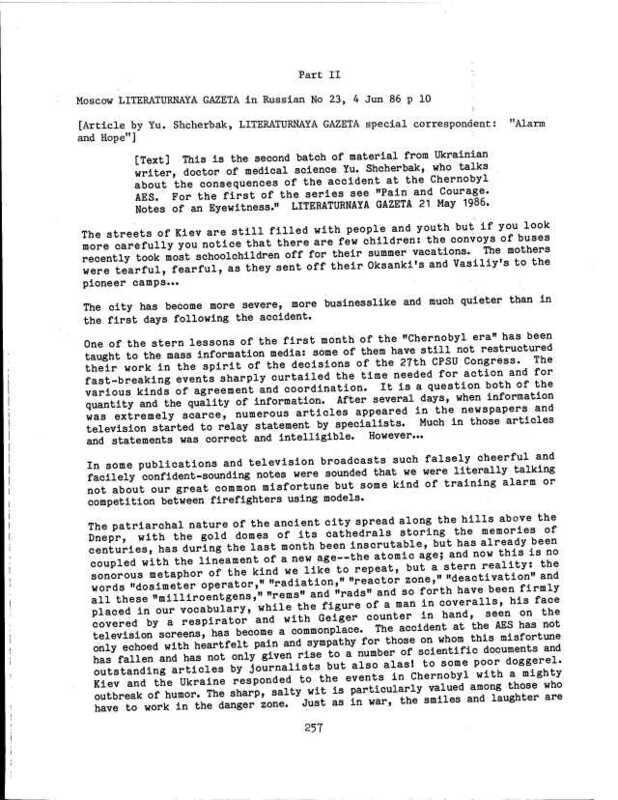 A 1981 report covers the less publicized Soviet nuclear "accident" near Kyshtym in 1957-58. Media reporting of the nuclear accident near Kyshtym first appeared in 1958. It was not until 1976, when the writings of Soviet dissent Dr. Zhores Medvedev began to appear, that wider attention was given to this subject. Medvedev, an exiled Soviet geneticist, claimed in several articles and books that a "disaster" occurred near Kyshtym in 1957/58. He alleged that thousands of casualties and widespread, long-term radioactive contamination occurred as the result of an explosion involving nuclear waste stored in underground shelters. The general consensus today is that a combination of events, rather than a single isolated incident at Kyshtym nuclear energy complex caused the radioactive contamination in the area. A study of the claims by Medvedev can be found in the Department of Energy section, in the 1982 report "An Analysis of the Alleged Kyshtym Disaster"
900 pages of foreign media monitoring reports from 1986 to 1992, produced by the U.S. government's National Technical Information Service's U.S. Joint Publication Research Service. They contain information primarily from Russian and Eastern Block news agency transmissions and broadcasts, newspapers, periodicals, television, radio and books. Materials from non-English language sources are translated into English. The reporting includes firsthand accounts of experiences during all points of the Chernobyl disaster. Topics covering the accident and its aftermath including domestic and international politics, sociological affairs, Chernobyl nuclear disaster plant fire, evacuations, sealing the reactor, cleanup mobilization, health implications, and people returning to region. 1,244 pages of reports dating from 1982 to 2009 produced or commissioned by the Department of Energy. The agencies and institutions contributing to these reports include Los Alamos National Laboratory, United States Nuclear Regulatory Commission, Lawrence Livermore National Laboratory, Savannah River Nuclear Solutions, Oak Ridge National Laboratory, Brookhaven National Laboratory, Argonne National Laboratory, and the Pacific Northwest Laboratory. 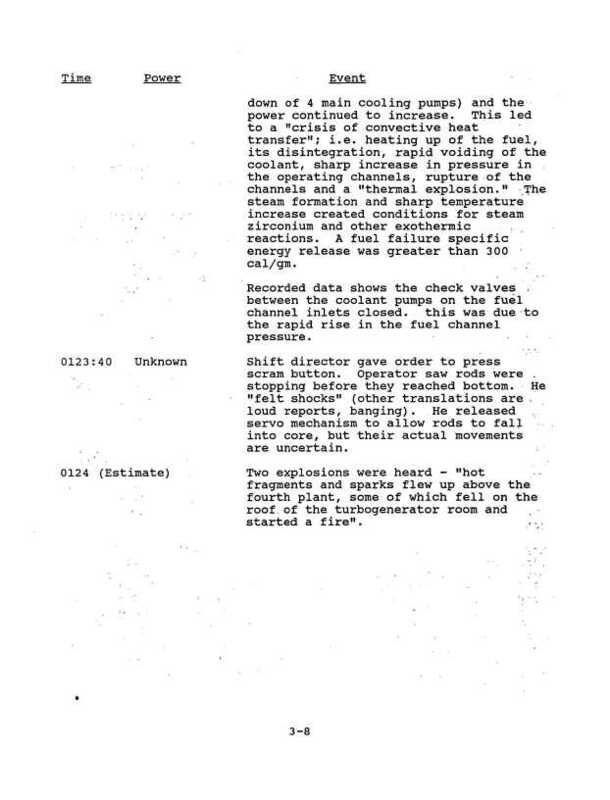 The 1986 Report of the U.S. Department of Energy's Team Analyses of the Chernobyl-4 Atomic Energy Station Accident Sequence DOE/NE-0076. The U.S. Department of Energy (DOE) formed a team of experts from Argonne National Laboratory, Brookhaven National Laboratory, Oak Ridge National Laboratory, and Pacific Northwest Laboratory. The DOE team provided the analytical support to the U.S. delegation for the August, 1986 meeting of the International Atomic Energy Agency (IAEA), and to subsequent international meetings. 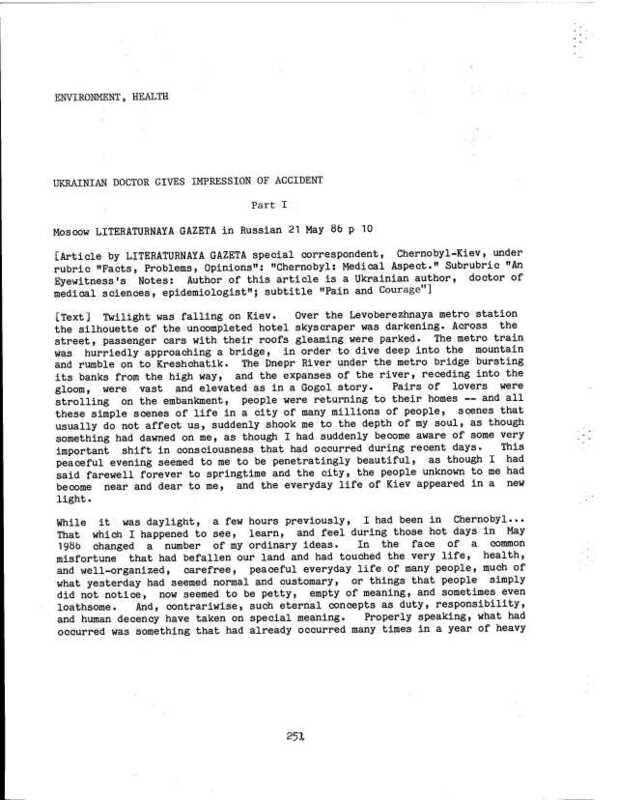 The DOE team analyzed the accident in detail, assessed the plausibility and completeness of the information provided by the Soviets, and performed studies relevant to understanding the accident. The Lawrence Livermore National Laboratory performed a variety of measurements to determine the level of the radioactive fallout on the western United States. The laboratory used gamma-spectroscopy to analyze air filters from the areas around Lawrence Livermore National Laboratory in California. Filters were also analyzed from Barrow and Fairbanks, Alaska. Milk from California and imported vegetables were also analyzed for radioactivity. Other report titles include: An Analysis of the Alleged Kyshtym Disaster; Workshop on Short-term Health Effects of Reactor Accidents; Preliminary Dose Assessment of the Chernobyl Accident; Internally Deposited Fallout from the Chernobyl Reactor Accident; Report on the Accident at the Chernobyl Nuclear Power Station; Radioactive Fallout from the Chernobyl Nuclear Reactor Accident; Radioactivity in Persons Exposed to Fallout from the Chernobyl Reactor Accident' Radioactive Fallout in Livermore, CA and Central Northern Alaska from the Chernobyl Nuclear Reactor Accident; Projected Global Health Impacts from Severe Nuclear Accidents - Conversion of Projected Doses to Risks on a Global Scale - Experience From Chernobyl Releases; The Chernobyl Accident - Causes and Consequences; Chernobyl Lessons Learned Review of N Reactor; Reconstruction of Thyroid Doses for the Population of Belarus Following the Chernobyl Accident; The characterization and risk assessment of the Red Forest radioactive waste burial site at Chernobyl Nuclear Power Plant; Estimated Long Term Health Effects of the Chernobyl Accident; and Environmental Problems Associated With Decommissioning the Chernobyl Nuclear Power Plant Cooling Pond. 816 pages of reports dating from 1990 to 2010 produced or commissioned by the Department of Defense. 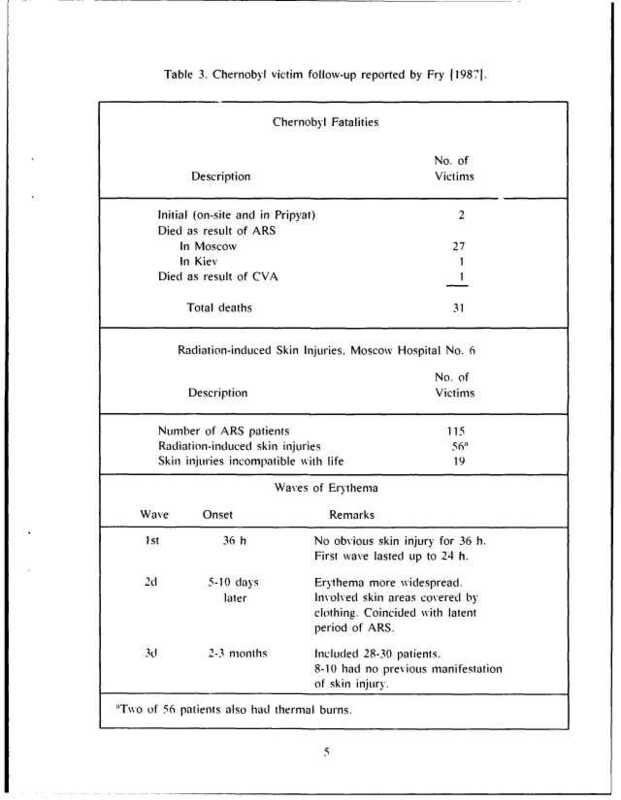 The reports include: Chernobyl Accident Fatalities and Causes; Biomedical Lessons from the Chernobyl Nuclear Power Plant Accident; Nuclear Accidents in the Former Soviet Union Kyshtym, Chelyabinsk and Chernobyl; Retrospective Reconstruction of Radiation Doses of Chernobyl Liquidators by Electron Paramagnetic Resonance; Neurocognitive and Physical Abilities Assessments Twelve Years After the Chernobyl Nuclear Accident; Simulating Wet Deposition of Radiocesium from the Chernobyl Accident; and Radiation Injuries After the Chernobyl Accident Management, Outcome, and Lessons Learned. 184 pages of reports from the United States General Accounting Office, whose name was later changed to the Government Accountability Office. The four reports are Comparison of DOE's Hanford N-Reactor with the Chernobyl Reactor (1986); Nuclear Power Safety International Measures in Response to Chernobyl Accident (1988); Nuclear Power Safety Chernobyl Accident Prompted Worldwide Actions but Further Efforts Needed (1991); and Construction of the Protective Shelter for the Chernobyl Nuclear Reactor Faces Schedule Delays, Potential Cost Increases, and Technical Uncertainties (2007). 634 pages of transcripts from three Congressional hearings: The Chernobyl Accident Hearing before the Committee on Energy and Natural Resources, Ninety-ninth Congress, 2nd session on the Chernobyl accident and implications for the domestic nuclear industry, June 19, 1986; The Effects of the accident at the Chernobyl nuclear power plant hearing before the Subcommittee on Nuclear Regulation, United States Senate, One Hundred Second Congress, second session, July 22, 1992; and The legacy of Chernobyl, 1986 to 1996 and beyond hearing before the Commission on Security and Cooperation in Europe, One Hundred Fourth Congress, second session, April 23, 1996. Wikipedia article about the 1986 nuclear plant accident in Ukraine.